Marine fuel filters are just that- a filter in the fuel line that screens dirt, rust, and debris from the gas. 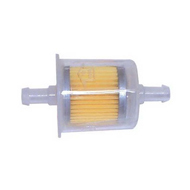 Fuel filters are cartridges that contain a paper filter, and are intended to be changed routinely, to prevent damage to engines and other fuel line components. No boat engine fuel line should be without one. Even the freshest fuel may contain contaminants that range from rust, caused by moisture within the gas station’s fuel pump, to paint, dirt, and debris that fall into the tank or gas can while it is being filled. 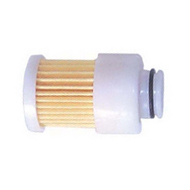 It is easy to spot a clogged fuel filter, as it usually has already caused the engine to stall. By this time there may be underlying symptoms of engine damage as well. Buy a Supply of Marine Fuel Filters from Wholesale Marine Today! Expensive fuel line repairs and replacements can easily be avoided by changing marine fuel filters as often as recommended by the engine’s manufacturer. If you take your boat out in brackish, salt, or muddy water, be sure to swap out your old fuel filter more often. Wholesale Marine stocks everything you need to keep your boat running smoothly. We have an extensive inventory of marine fuel filters to fit the major engine manufacturers including Evinrude, Honda Marine, Johnson, MerCruiser, Mercury, Nissan, OMC, PleasureCraft Engine Group, Tohatsu Outboards, Volvo Penta, and Yamaha, with quality replacement parts from Moeller and Sierra. If you are not sure what part you require, you can speak with one of our knowledgeable staff and be confident you’ll buy just what you need. Whether your boat requires a major part or a supply of marine fuel filters, when you become a Wholesale Marine customer, our selection, experience, and renowned customer service promises that you’ll return. When you need advice about which marine fuel filters you’ll need, or anything else for your boat, give us a call. Call us at (877) 388-2628 for same day, flat-rate shipping and our low price guarantee. We’re here from 9:00 AM until 6:00 PM, EST, Monday through Friday. Be sure to ask about our Captain’s Loyalty program for additional discounts every time you shop at Wholesale Marine.